Nine years ago Molly Baldwin found herself in a curious position. Roca, the teenage pregnancy and violence prevention program she’d founded in her 20s, had a multimillion-dollar budget, a two-story building in downtown Chelsea, Mass., a portfolio of programs addressing everything from poverty to immigrant rights and a measure of fame for using Native American peacemaking circles to heal gang-impacted youth. The only problem was, those cathartic conversations weren’t translating to change.“They would come to Roca and we were all into development, growth and self esteem, and they would feel good,” said Baldwin. “Then they’d go and shoot people and deal drugs.”Once she faced reality, Baldwin was able to pinpoint Roca’s weaknesses. First, it was providing services and space for practically anyone who walked through its doors. Second, its young people’s lives constantly intersected with agencies like the police, probation and schools, yet, too often, Roca fought with those institutions. Roca’s third flaw was that it didn’t know how or whether its programs created positive change among at-risk youth. Baldwin did the unthinkable. She brought all of Roca’s programming to a halt and began an agonizing pruning process. During the dormancy, she and her team asked themselves where the program could have the greatest impact. They decided to focus Roca’s energies on tackling mass incarceration by engaging and transforming young men between ages 17 and 24 who were at the “deep end” of the criminal justice system. These young people had already demonstrated a strong propensity toward violent crime and were either aging out of juvenile justice or beginning a revolving-door relationship with adult corrections departments. Statistically, 55 percent of this population returned to crime within three years of release, costing taxpayers between $47,000 and $71,000 to imprison per person over an average of 12 to 18months and robbing their communities of a generation of human potential. Roca knew it was taking on a challenge most youth-centered organizations avoided or simply weren’t equipped to deal with. Deep-end youth frequently have extensive criminal records, incomplete education histories and no formal work experience. These backgrounds make them hard to retain in programs and even more difficult to place in gainful employment. Roca, Spanish for “rock,” re-emerged with a reasoned strategy, a measurable theory of change, a customized data-and-software system for measuring performance, and a comprehensive training and supervision program, all attuned to its new target population. 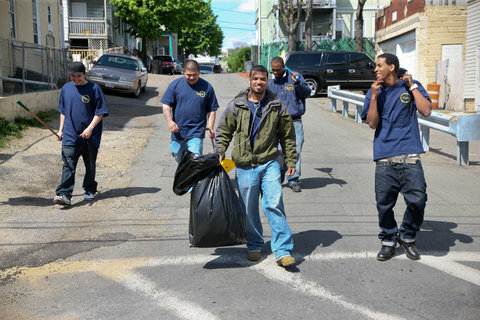 Peacemaking circles remained a featured component of the model, but now Roca complemented them with rigorous skill-based classes, one-on-one motivational interviewing sessions that encouraged reflection and transformation and structured transitional jobs with its municipal and corporate partners. With a formal structure in place, Roca began aggressively recruiting young men into the program and helping them build life and job skills so that they would gain confidence and, ultimately, independence. The early returns showed promise. 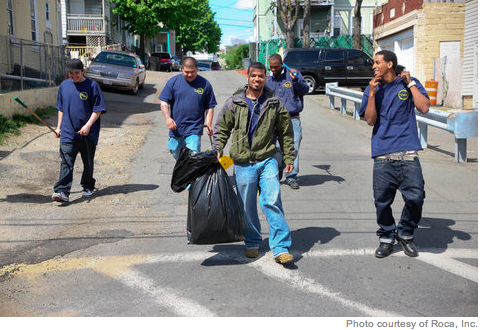 As Roca tweaked the model, more young men from Chelsea and Springfield, Mass., its first replication site, remained out of the justice system’s web and in permanent work. Photo courtesy of Roca, Inc. Roca participants on a supervised work crew, which is one component of Roca’s transitional employment program. Now comes the real test. In January Roca was selected to lead the seven-year, $27 million Massachusetts Juvenile Justice Pay for Success Initiative, in partnership with five private foundations and Goldman Sachs’ Social Impact Fund. This kind of Pay for Success program, also known as Social Impact Financing or Social Impact Bonds, brings together public and private funds to provide upfront money for prevention programs. The basic idea has been around since the late 1980s and in play in Britain since 2010, but first gained notice in the United States in 2012 when New York City and Goldman Sachs launched the nation’s first pay-for-success pilot to reduce recidivism among 16-to-18-year-olds on Rikers Island. Now such programs are exploding throughout Britain and the United States and in many other countries. The Massachusetts initiative is easily the largest, most ambitious and risky experiment in the United States to date. The arrangement requires Roca to realize a 40 percent reduction in incarceration days compared to a control group among a cohort of up to 1,320 young men in Chelsea, Springfield and Boston over the next seven years. If Roca hits that target, investors will receive $22 million in success payments. If it does even better — if it reduces the days by 70 percent — investors could realize close to $27 million in payments and Massachusetts would save $45 million in taxpayer dollars. However, if the project fails, then the Goldman fund would lose its $9 million loan, as would each of the junior philanthropic lenders, including Roca, who put up 15 percent of its service fees in the deal — more than $4 million. Unlike at-risk youth models that focus on preventing crime, Roca only includes candidates who have a felony record, are in a gang or under state supervision, lack a G.E.D. and live in Roca’s geographic areas. Once a candidate has been identified, a youth worker has to go out and recruit him. Participation in Roca isn’t a requirement of probation for these men, so its youth workers have to build a relationship that gets the young man in the door. That could mean showing up at the park where he hangs out, calling his loved ones or connecting with his probation officer and local police. Even then, a young man could attend life and job skills sessions for six months, make strides, then disappear. If anyone can appreciate the redemptive promise that Roca offers, it’s Bravo. He grew up in an underprivileged single-parent home in nearby Hartford, Conn. Coming out of high school, he won a basketball scholarship to American International College in Springfield, but made some regrettable choices when he got there — he didn’t go into the details — and wound up behind bars. Once he was ready to accept responsibility for throwing away a golden opportunity, Bravo decided to use his prison term as a chance to prepare for a new life when he got out. After serving nearly three years he returned to college, this time at Bellevue University in Nebraska. As soon as he finished his degree he went back to the East Coast in search of a job that would allow him to give back. He found out that Roca was opening an office in Springfield and applied. Molly Baldwin sat in on Bravo’s first interview. He was impressed that the founder would take the time to sit with him. For her part, Baldwin saw in Bravo a model of change the young men could learn from. He’d made mistakes and turned his life around. She offered Bravo the chance to put his experience to work. He had a total of 25 young men on his list and he saw each of them at least once a week. I asked him how he managed his load and he explained his system. Between Monday and Wednesday he tries to get all 25 into the office. Some guys show up for meetings because they’re invested in changing their lives. Those are his easier cases. Others want nothing to do with Roca. Bravo expends the bulk of his time and energy on these cases. It could take weeks or months to reel these guys in. He might call, text, pay surprise visits — all without any response. Invariably, one day, or night, he’ll get his chance to prove Roca’s value. A guy might be in custody and have no one to turn to or need someone to go to court with him or just want to stop making stupid decisions. Whatever it is, he’ll finally reach out and Bravo will make it his business to be there for him. Sadly, though, even that’s not always enough. He told me that in just one four-month period he attended three of his young men’s funerals. “They think I’m selling them this program, but really I’m selling a better life,” he said. Roca tracks every interaction in an online data system. If the data shows even the slightest sign that a young person is drifting toward relapse — his behavior during a meeting indicates ambivalence about his future after weeks of positive change talk, for instance — Bravo and the other youth workers initiate an intervention. They will go out and find him in the neighborhood, sit down and show him the data. Together they’ll use it to investigate what may be disrupting his positive mind-set and chart a plan to get him back on course. If a young man consistently hits Roca’s behavioral targets over a period of several months, he enters Roca’s transitional employment phase, typically on a work crew making $8 an hour. Its list of partners includes the cities, school districts, housing authorities, landscaping companies and construction firms. “It was hard. It was a major change,” said a Roca participant named Kelord of his experience with Truss Engineering Corp., where he manufactured wooden roofs and floor trusses. Kelord is typical of Roca’s population. He dropped out of 9th grade and started selling drugs. By 17 he was in jail for drug distribution. By his early 20s he had a child, multiple arrests on his record and no marketable skills — much less a sense of self-efficacy. He felt trapped in a cycle of drug dealing, jail and chronic unemployment when Roca found him. In phase one his youth worker helped him articulate goals, identify the barriers in his path and begin mapping strategies to change his behavioral patterns. He demonstrated the required growth to move into the transitional employment phase — and there he got stuck. For almost two years, Kelord struggled to hold a job. Like so many of his peers, he was used to making quick money and unaccustomed to showing up at work every day before dawn and returning to Roca in the evening for classes and counseling. “I would make it for a month or so, and then just throw it all away,” he recalled, echoing Bravo’s earlier point. Based on what Roca has learned on its own and through experts, it takes 60 days of transitional employment without an absence for its young people to start showing up for themselves and making lasting changes. To that end, it subsidizes each participant’s salary and welcomes him back every time he falls off. But what’s really unique is that Roca’s corporate partners understand they may need to give their young employees multiple chances to perform — and sign on anyway. At 24, Kelord is now in phase three of Roca’s intervention model. His youth worker is still there when he needs support, but, for the most part, he’s on his own. He got his G.E.D. and holds a permanent and promising position with Jiffy Lube, one of Roca’s partner employers. He’s taking care of his family and planning for his future. Moreover, he’s working with phase one participants. Kelord’s transformation is exactly what the public and private sector are betting big on. An internal study overseen by Harvard’s Kennedy School of Government in 2013 found that Roca’s model reduced recidivism 65 percent and increased employment 100 percent among its target population. However, the study lacked the scope and resources to account for selection bias. For the Pay for Success program, Baldwin and the project’s financial intermediary, Third Sector Capital Partners — which has also staked 15 percent of its management fee on the project’s success — chose a randomized control study. Young men cycling out of youth services or through the probation system who meet the pilot’s demographic criteria will either be referred to Roca or placed in a control group. An independent evaluator will track both groups and assess the data. An independent validator will then audit the evaluator’s work. The Kennedy School and Roca’s own evaluator, Abt Associates, will also be monitoring and evaluating the data. Ultimately, Roca’s success will depend on the progress made by the men randomly assigned to the program — whether they choose to participate or not. This puts tremendous pressure on veteran youth workers like Bravo to bring them into the program and keep them coming back, something he acknowledges that not even a successful program can guarantee. Join Fixes on Facebook and follow updates ontwitter.com/nytimesfixes. To receive email alerts for Fixes columns, sign up here. Dax-Devlon Ross is the author of five books, a contributing writer for Next City Magazine and a nonprofit education consultant. You can find him atdaxdevlonross.com and on Twitter @daxdev.